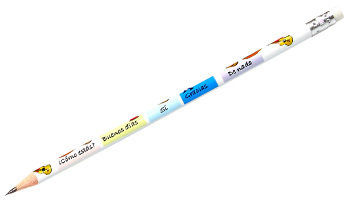 Reward your pupils with these fabulous reward pencils that will help them to learn common phrases in Spanish. With HB hardness and erasers on the ends, they are supplied in packs of 12. Complies with standard EN71. Essential for every primary MFL teacher! I love the pencils and I think my students will as well. But what impressed me most was the timing of the delivery. The package, sent from the U.K. to Utah in the United States, arrived 2 or 3 weeks sooner than the estimated delivery date. Thank you, Little Linguist!! I will surely be ordering from you again!